Spanish architecture studio SelgasCano has unveiled its first commission in France – a vast pavilion of translucent waves that fills the courtyard of the Fondation d'entreprise Martell in Cognac. Spread across 1,340 square metres in the venue's extensive courtyard, the pavilion is made up of 31 rows of undulating steel structures covered with a sheer translucent polyester and fibreglass material developed by French brand Onduline. 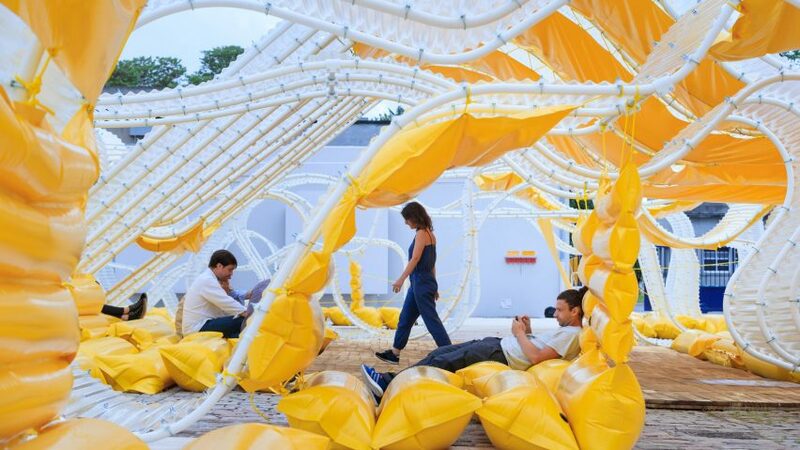 Underneath the pavilion's rippling archways, 786 yellow PVC cushions filled with water anchor the structures to the ground while also providing places for people to sit or lie down. Described by SelgasCano as "a vast paper forest which you could enter, walk around and get lost in", the pavilion is designed to house specific activities, events and performance-based experiences at the foundation. Just one-millimetre-thick, the polyester and fibreglass material that covers the pavilion is one of the lightest and most cost-effective materials on the market. "Lightness has been a constant and integral aspect of our work, and we saw this project as a unique possibility to experiment and explore that concept further," explained the firm's founders, José Selgas and Lucìa Cano. "Owing to the vast dimensions of the project, the material needed to be accessible and available in large quantities. It also needed to be light, so as to be easy to dismantle and transport to its future location." "[The material's] appearance and thinness reminded us of traditional Japanese rice paper," continued the architects. "Suddenly, the whole exercise became about discovering a way to work with paper – rice paper, fibreglass paper – and finding a way to play with its shape so as to make it as rigid as possible." The Fondation d'entreprise Martell occupies a modernist building in the town of Cognac and is currently undergoing renovation works that will be completed in serval phases. The foundation will ultimately extend over nearly 5,000 square metres and five floors, offering an array of different immersive and creative spaces. The interior renovation, orchestrated by Bordeaux architects Brochet-Lajus-Pueyo, began in spring 2017. A partial reopening, including the ground floor and rooftop terrace, is scheduled for summer 2018, followed by a gradual roll-out of the building’s other floors every year until the completion of the project in 2020-21. The SelgasCano pavilion will occupy the foundation's courtyard until the first phase of work on the building is completed in summer 2018. "We were given an extensive blank canvas and we wanted to set the tone by occupying the entire site with our pavilion, in the hope of inspiring future artists, architects and designers," said the architects. After the end of its life, the pavilion, which follows on from Par Nature – an immersive 600-metre-squared work by French artist Vincent Lamouroux – will be dismantled and reconstructed elsewhere. SelgasCano is known for creating transparent and open buildings. In 2015 the firm created a colourful plastic-wrapped Serpentine Gallery Pavilion in London, while its plant-filled co-working space for Second Home in Lisbon occupies a 1,115-square-metre open-plan space inside a historic market hall.